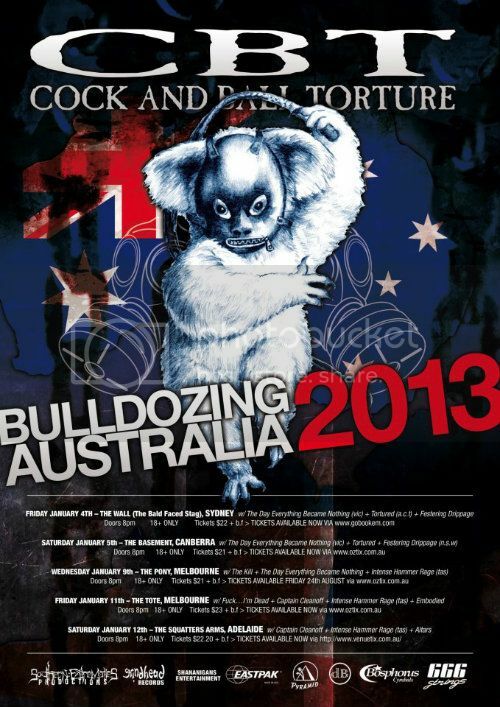 tourAusGrind: Australian underground grindcore, punk, doom and DIY culture. I'm extremely envious. Those boys have managed to pull off an amazing little tour over in one of my favourite countries, Japan. It's not right that I am though, neither of my bands have put in much effort to do anything but yeah.... How good is it to be human! Anyway, here's the details of their first show and it's a doozey! Bands from all over are coming together for this bit of messy noise. Up there in the Jap's eye! An all international cast! Then there's the big one, the massive deal, probably one of their greatest gigs to date... The Japanese Obscene Extreme! The way it all goes down. So many great bands, so many forms of freak music, Obscene always rules!! We wish you well young Australian men! You can purchase many Dark Horse things from the Grindhead Records website such as their album Sick of the Living/High on Death, the split with Repulsion-esque Black Jesus, or the other split with Indonesian Gore Grinders Badak Singa. You also have the choice of going to their bandcamp.